The Del Rio Chamber of Commerce is at 1915 Avenue F. 830-775-3551. Check with them for walking and driving tours of Del Rio, and information on crossing the border to Ciudad Acuna. The bridge to Acuna is nearly 3 miles from Del Rio, but all day parking is available at reasonable rates on the U.S. side. CIUDAD ACUNA has a population of nearly 120,000 but is surprisingly clean and tranquil compared to other border towns. 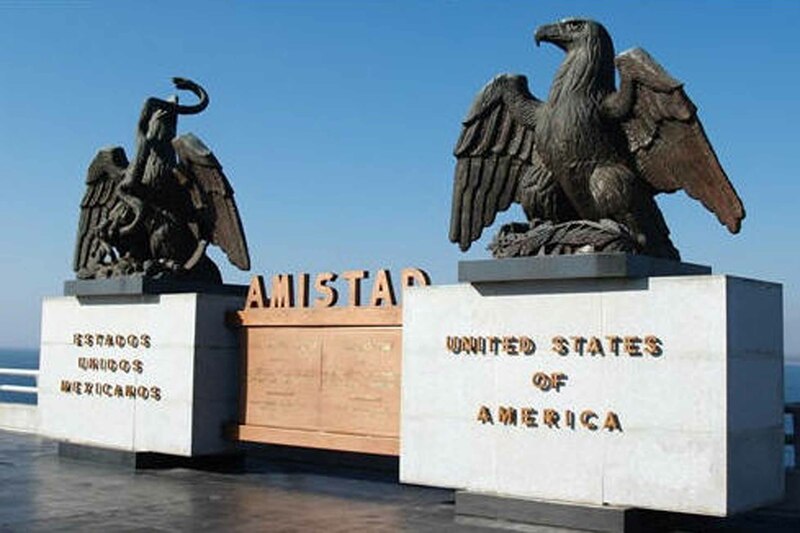 The Dam at Lake Amistad is a good photo opportunity for the magnificent twin eagle statues (fraternal not identical). The big attraction of course is Lake Amistad. With 1000 miles of shoreline and 65,000 acres, this is one lake in Texas (and Mexico) that is not over-fished. Besides fishing, Lake Amistad offers swimming, boating and even scuba diving. Managed by the National Park Service, the headquarters is on Hwy 90 just west of the city limits. The U.S. side has 3 marinas with one reserved for Air Force personnel. The Mexican side has a marina and a Mexican fishing license is required if you fish that side, but it is sold at the U.S. marinas as well. The U.S. Park Service and U.S. Border Patrol have a strong presence in Lake Amistad. In fact, Lake Amistad is the first to have the U.S. Border Patrol and National Park Service joined operations. The Park Service and Border Patrol's Lake Task Force operate out of the same building which is located overlooking Lake Amistad (International Amistad Reservoir). This location gives the Agencies a vantage point that offers shorter travel distances and quicker response time for Rangers and Border Patrol agents alike. The Del Rio Chamber of Commerce hosted a forum on Thursday, June 17th, in which the Border Patrol, Texas Parks & Wildlife, and National Park Service discussed safety at Lake Amistad. These agencies maintain through their joint efforts they have been able to keep Lake Amistad one of the safest lakes in Texas. Recent developments at nearby Lake Falcon, have contributed to a decline in tourism and recreation due to concerns related to violence along the border. Despite Lake Amistad’s proximity to the border, the Border Patrol asserted that their presence is a significant contributing factor deterring illegal activity from Mexico. Rob Finely, Director of Marine Operations for the Border Patrol said, “One of the goals of the National Border Patrol Strategy is to apprehend terrorists and terrorist weapons illegally entering the United States and, also included within that strategy is to apprehend and deter smugglers of human, drugs and other contraband. We have agents dedicated to patrolling nothing but the lake 24/7 to ensure the security of the lake, the community and the international border.” Captain Game Warden Marco Alvizo of the Texas Parks & Wildlife discussed how state funds approved through the Texas Legislature have been of a great benefit to Lake Amistad. Captain Alvizo said, “We have been able to hire up to 4 more State Game Wardens to help protect our citizens and tourist out at Lake Amistad.” Alan Cox, Superintendent of the National Park Service, asserts that despite a decrease in visitors to Lake Amistad, there has been a 5% increase in bass fishing tournaments and a 25% increase in boat rentals. “These numbers indicate tourist have a great faith in our law enforcement, and it is my assumption visitations have decreased as many Del Rioans are going out of town during these summer vacation months,” said Cox. Despite any stigmas which may be associated with issues in Mexico, Lake Amistad has yet to see any direct impact nor has their been any boating fatalities for the past 5 years.